The 2018 Maserati Ghibli is the gateway into the Italian exotic brand. Starting at $75,000, however, there's little that's "entry level" about it. The Ghibli will surely bring envy with its Ferrari-built V6 and brand provenance, but in reality, you can get a lot more vehicle for less with a mainstream-luxury sedan like a BMW 5 Series. If exclusivity, Italian flair and being able to boast that you drive a Maserati mean more to you than horsepower figures or lap times, then the Ghibli is probably the new Maserati you've been waiting for (and/or the one you can afford). Just because it's a Maserati doesn't mean it's blazing fast or even all that rewarding to drive. In reality, a sub-$40,000 base Alfa Romeo Giulia will beat a standard Ghibli to 60 mph, all while packing its own Italian style. A more mainstream BMW M550i may lack Maserati's cachet, but it will roast a Ghibli off the starting line. Moreover, either of these potential rivals is simply more enjoyable to drive. The Maserati Ghibli receives a substantial makeover for 2018 that includes increased horsepower (to 424) for Ghibli S models, electric power steering, interior and exterior styling updates, and a suite of active driving and safety features. Two trims are also introduced -- the luxury-oriented GranLusso and the sportier GranSport. Since its inception a few years ago, the Maserati Ghibli has featured an interior that on one hand flaunts supple leather, elegant Italian craftsmanship and various other nice touches. Other details, such as buttons and switches from the parts bin of its Fiat Chrysler parent, were far less impressive. While examples of those latter traits remain, updates have addressed some of those issues. The new GranLusso trim features a silk interior from Italian fashion icon Ermenegildo Zegna. Last year's introduction of the 8.4-inch central touch screen found in other Chrysler group cars -- here with a Maserati-specific interface -- helped bolster the Ghibli's infotainment appeal with features like Apple CarPlay and Android Auto integration. The front seats are plush and well-padded, but rear-seat room remains on the tighter side. At 17.7 cubic feet, the trunk has ample room. The Ghibli skin has also been tweaked for 2018, with GranLusso and GranSport variants featuring distinctive bumper designs. Both of those new trims also receive full LED headlights. A nice new touch is the option of soft-close doors. The majority of the Ghibli's design remains an appealing blend of voluptuous curves and distinctive design elements like a concave grille with the Maserati trident logo prominently in the middle. The upward-rising sill of the rear doors stands out on the outside but can limit visibility within. Quad tailpipes at the rear emphasize the Ghibli's performance nature. With 345 horsepower in base form or 424 in the more potent Ghibli S, this Maserati sedan certainly has the beans to be quick. The quickest, no, but enough to hit 60 mph in 5.5 seconds for the former and down to 4.7 seconds for the latter. Its powertrain and exhaust also make addicting sounds while doing so, and this engine can brag of being made by corporate cousin Ferrari. Shifts are smooth via the standard ZF 8-speed automatic transmission. These numbers look good, but in reality, we found the Ghibli just doesn't quite stack up, especially for its price. Power is there, but so is turbo lag to get to that point. The suspension is firm, especially if you opt for the stiffer sport setup. Steering has been improved thanks to the new EPS system, but it still doesn't measure up to the best. Put together, the Ghibli just doesn't have the performance cohesiveness or provide the overall driving satisfaction of more mainstream rivals like the BMW 5 Series, Lexus GS, Mercedes-Benz E-Class or Audi A6. The Manufacturer's Suggested Retail Price (MSRP) for the 2018 Maserati Ghibli starts just over $75,000 once you factor in the $1,250 destination fee. The higher-power Ghibli S begins over $80,000, and the all-wheel-drive Ghibli S Q4 starts over $83,000. Options, including the GranLusso or GranSport trims, can add thousands to these prices. 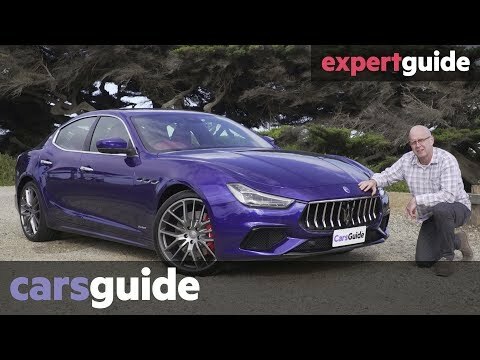 Befitting its exotic badge, the Maserati Ghibli's prices are higher than mainstream luxury-midsize sedans such as the Mercedes-Benz E-Class, BMW 5 Series, Audi A6 and Lexus GS, all of which arguably offer more value for the money, if not the cachet and exotic appeal that go with the Maserati badge. Those brands also have far wider dealer networks, something to keep in mind for both the initial purchase and future maintenance needs. Before buying, check the KBB.com Fair Purchase Price to see what others in your area are paying for their new luxury-sports sedan. The Maserati Ghibli's resale value has trailed that of more mainstream brands, and is far below that of the Lexus GS. With a price tag starting over $75,000, it's little surprise that the 2018 Ghibli brings much more than the intrinsic appeal of its Maserati image. Among its standard highlights are leather interior, heated and 12-way power-operated front seats, sunroof, power-adjustable steering wheel, dual-zone climate control, universal garage/gate opener, 19-inch wheels, and blind-spot monitoring system. The Ghibli's infotainment system uses an 8.4-inch display that can be controlled via touch or a rotary controller and features navigation and Apple CarPlay/Android Auto smartphone integration. Standard audio bundles an 8-speaker/280-watt AM/FM/CD system with USB/SD/aux inputs and Bluetooth connectivity. The Ghibli S comes with the more potent version of the V6 engine, as does the Ghibli S Q4, which signifies all-wheel drive. The new Ghibli GranLusso trim adds luxurious amenities such as extended leather interior trim with silk inserts, open-pore wood trim, ventilated front seats, heated steering wheel with wood inserts, power-operated rear sun blind, and upgraded harman/kardon audio system. The sportier GranSport stands apart with steering-wheel-mounted shift paddles and Skyhook electric damping suspension (both optional on other trims), 20-inch wheels with summer performance tires, and sport-design seats. Options available across trims include a Bowers & Wilkins audiophile sound system, soft-close doors, hands-free power trunk, power-adjustable foot pedals, and in-car Wi-Fi hotspot with 1-year trial. The Driver Assistance Package includes important safety and driving aids like adaptive cruise control with stop-and-go, active blind-spot monitoring, lane-keeping assist, surround-view camera system, and forward-collision warning system with automatic emergency braking. For 2018 the Ghibli offers a well-rounded roster of safety and driving aids, including adaptive cruise control with stop-and-go functionality, lane-keeping assist, forward-collision warning with automatic emergency braking, and an active blind-spot monitor that can help steer the car away in the event of a potential collision. If you want a Maserati but live where snow and slick roads are part of life, turn your attention to the 2018 Ghibli S Q4. In addition to the more powerful engine, you'll get traction-enhancing all-wheel drive (AWD) vs. the standard rear-wheel drive (RWD). All versions of the Ghibli are powered by a 3.0-liter twin-turbo V6 designed by Maserati and built by Ferrari. The engine comes in two states of tune. Base models make 345 horsepower, while the Ghibli S now puts out 424 horsepower, a 20-unit improvement over last year's model. All models feature an 8-speed automatic transmission and a mechanical limited-slip differential. All-wheel drive is only available on the higher-powered Ghibli S model. Even in its stronger form, the Ghibli is hardly the most powerful luxury-sports sedan out there, but it's still respectable. All models use an engine start/stop system that cuts power at idle to save fuel. Speaking of, with a high of 24-mpg highway, the Ghibli isn't exactly an efficiency champ. The 2018 Maserati Ghibli is the gateway into the Italian exotic brand. Starting around $75,000, however, there's little that's "entry level" about it. This luxury sedan packs a Ferrari-built twin-turbo V6, follows the performance-car tradition of being rear-wheel drive (all-wheel drive is optional), and features fine Italian craftsmanship inside and out. But this Maserati's biggest boast is that it's a Maserati. Attaining one means you can finally say you drive a Maserati. That's the good news. The flip side is that you can get faster, more technically advanced and simply more rewarding sedans like a V8-powered BMW 5 Series or Mercedes-AMG E 43 for less money. And for about the same starting price, you can get its slightly smaller -- but far more powerful -- cousin, the Alfa Romeo Giulia Quadrifoglio. Great engine and performance. It is a pleasure to drive.